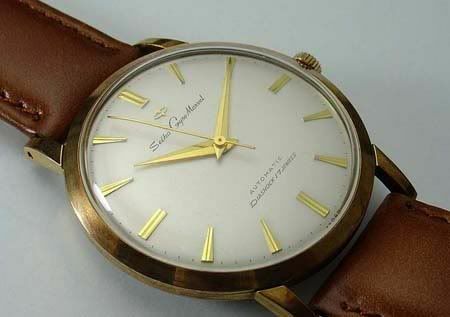 Browsing the forums at WatchUseek, I decided to click the Seiko/Citizen/Orient forum for a change. I noticed all these posts with subjects which look like total jibberish to me. Weird feeling, because I was under the impression that after almost 10 years of this watch crazyness, I could identify most watch descriptions. Anyway, a good way to start was to click a thread called ‘Pics of your current Seiko collection’ where WuS¬visitors are being asked to participate by showing their Japanese watch collection. Pictured below is the Seiko Gyro Marvel watch with automatic movement cal.290 dated ca 1959. Owner Robert has a bunch of Seikos in his collection and shows them with pride! By the way, I don’t have an opinion on Japanese watches 🙂 I just prefer Swiss or German watches. Having said, I really do like my Casio G-Shock limited edition (20th anniversary on the original G-Shock DW 5000 dating 1983) I bought in 2003.